Live Set Documents One of Davis’ Final Excursions With a Program of Standards Given his gargantuan recorded output, Miles Davis seldom abandoned a conceptual vision in the studio, particularly after the turn of the 1960s. Which makes a live document such as Four & More all the more valuable for the manner in which it portrays the legendary trumpeter removed from thematic demands and interior confines, and instead letting loose onstage with a program of stellar material that he’d soon abandon in favor of experimentalism. 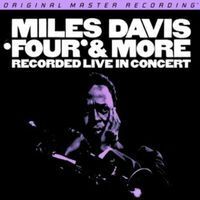 Part of our Miles Davis catalog restoration series, Four & More engages with electrifying speed and palpable punch, the effort now claiming vastly improved imaging, deeper soundstaging, and startling clarity. Mastered from the original master tapes, this unsurpassed digital edition teems with the urgency demonstrated by Davis and his band—notes flooding the listener with an attack only possible from sound featuring full frequency extension, tremendous spacing, and you-are-there immediacy. At last, these historic recordings are afforded the breathing room and acoustic perspective they’ve always deserved. For listeners that may be unfamiliar with this title, prepare to be blown away—literally and figuratively. Aficionados know what to expect on the music front, but this reissue ratchets up the thrills by several levels.